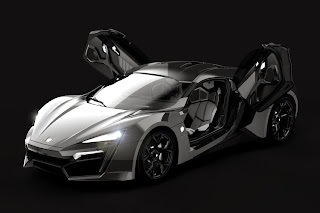 world as the first Arabian manufacturer of hypercars and will officially mark the world debut of the 'Lykan HyperSport 2014' (pre-production running car), an exterior prototype of the 'Lykan HyperSport' (special W Motors Blue color) and the world premiere of the design of the 2015 SuperSport model at the Dubai International Motor Show. The most anticipated sports car of the year, the Arabian Hypercar, will be exhibited at the Dubai World Trade Center (Stand SSA10) between the November 5-9 as part of the Dubai International Motor Show. Speaking out on the $3.4-million 'Lykan', the CEO of W Motors Ralph R Debbas said, "This is history in the making, the most exclusive and advanced Arabian Hypercar the world will ever see, simply a modern machine with a touch of humanity."